Discovery Launch Tuesday Morning - Solar System Planets And Moons Section. Discovery Set to Launch Tuesday Morning. 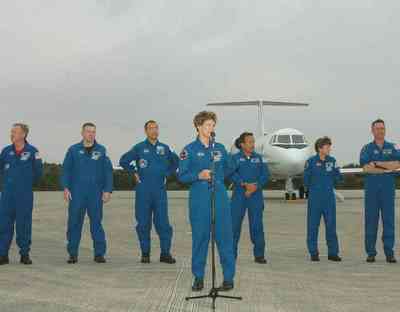 The Return to Flight mission STS-114 crew. Image credit: NASA/KSC. Engineers are still working to troubleshoot a malfunctioning fuel gauge on the Space Shuttle Discovery's external tank, but NASA has pinned down a launch date anyway. If all goes well, Discovery is expected to lift off on Tuesday, July 26 at 1439 UTC (10:39 am EDT). Even if the fuel sensor fails again, managers will go ahead with the launch, as they don't believe there's a risk to the shuttle - there are 3 additional sensors that perform the same task. With some work still to go, NASA is moving toward a new launch attempt for the Space Shuttle Discovery Tuesday, July 26, at 10:39 a.m. EDT. Engineers are wrapping up a troubleshooting plan to address a fuel sensor system issue that caused Space Shuttle managers to scrub the first launch attempt for the Return to Flight mission, STS-114. At a meeting today of the Mission Management Team, Shuttle managers decided on a plan to complete outstanding work on the External Tank's liquid Hydrogen low-level fuel sensor system circuit that runs from the External Tank into the Orbiter. The plan outlines a series of steps that could culminate in a launch next Tuesday. First, engineers will complete tests to look at electromagnetic interference as a factor in the sensor system circuit malfunction. Then, workers will swap circuits for two of the sensors to provide a means to isolate the problem to the wiring or the point sensor box, should the problem recur during the countdown. Next, engineers will shore up the electrical grounding to reduce further the chance of electromagnetic interference with the sensor system. For a Tuesday launch, the official launch countdown for Discovery will begin Saturday. During the countdown, engineers will closely watch the behavior of the sensor system circuit as the tank is filled with super-cooled propellants. Including the first launch attempt on Tuesday, there are at least four opportunities for Discovery to launch during the current launch window, which extends until July 31. NASA managers are also looking at the possibility of additional launch opportunities in the first week of August.